Here's another example of a character logo I illustrated/designed. I created this a long time ago. From what I gather the flavor is still going strong. For those of you who happen to be ice cream afficionados, the company that commissioned the logo happens to be the same one who brought you Moose Tracks Ice Cream. 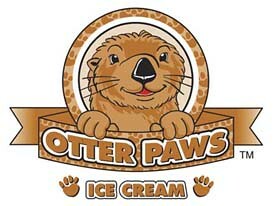 In addition to this logo I also created an alternate flavor logo entitled "Otter Stumps." Basically the paws were replaced with bloody stumps squirting blood. The client had a good laugh about it. What brought that about was the misconception that the client was going to cut off the paws of otters and place them in their ice cream. Makes sense doesn't it?